Even if you’re simply going on a boating holiday for the very first time and have never skippered a boat before, you’ll be given quick but thorough advice on how to drive and steer the boat as well as how to best avoid collisions. Therefore, if you’re living on a boat on a more permanent basis, you’ll obviously become far more experienced and knowledgeable about these types of issues with the more practice you gain. The important things in collision avoidance, therefore, are to understand the main reasons why collisions occur and to ensure that you pay heed to those when you’re sailing and to understand how best to avoid them. Well in addition to the factors mentioned above, there are several other aspects to boating which can help you to avoid collisions. 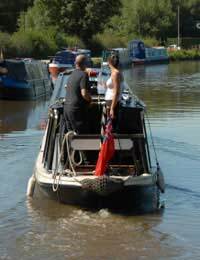 Firstly, understanding your boat in terms of its dimensions and the dimensions of the waterway you’re cruising on helps. Also it’s important to understand and check the headroom at bridges and tunnels and appreciating that their shapes and sizes vary alongside the fact that water levels rise. There’s also a tendency to encounter stronger flows of water as you approach locks, weirs and other areas where water is flowing into or out of the waterway and the effect that that can have on your boat’s speed and manoeuvrability as well as the effects that can be caused by strong winds and cross winds. All boats will have some kind of horn sounding device fitted to them and therefore it’s important to get into the habit of using it when it’s appropriate. This would include any occasions where you’re approaching a blind bend, a junction or a bridge or tunnel. It’s also important that you realise that some craft on the water may be a lot smaller than your own and may not even have an engine and so are much more difficult to both see and to hear so pay close attention to the likes of canoes and dinghies which may be sharing the water with you close by and look out for any debris sticking out of the water and for things like floating tree trunks. Leaving aside the damage to your own or another person’s boat which can result in a collision, any kind of collision can cause people to be thrown overboard into the water if the collision is powerful enough or, at the very least, can cause a person to fall over on deck and injure themselves. They can also result in people suffering from the likes of burns and scalds if, say, they were cooking at the time. In general, you should always have one person whose responsibility it is to keep a close eye on the water and what’s in it, around it and ahead of your boat situated at the front of the boat and whose duty at the time is to solely look out for possible scenarios that could cause a collision and to alert the skipper as soon as he/she suspects any potential dangers. People travelling on board can take turns in keeping this sort of ‘watch’ on a rota basis. Of course, this shouldn’t detract from the skipper’s own responsibilities and it’s important he/she is vigilant too.